This coming Thursday, January 10th at 7 pm, the teens at Eva Perry Library will be attempting to create a video entry, less than 90 seconds, for the Summer Reading Collaborative Teen Video Contest. Any teens can join us for the event. The theme is Beneath the Surface. We will need writers, actors, and camera people. There is prize money involved, $275 for the teen group, and $125 in prizes for the sponsoring library. For more information, visit the website. Want to see the winners from last year? Go here. This time of year is perfect for fantasy lovers! With Halloween around the corner, readers can easily transform into their favorite book character. For Harry Potter fans, it can be a tie, black gown and thick glasses. For Hunger Games followers, a bow and arrow in simple clothes may do (unless you can figure out a safe way to ignite a dress!). What about a little white powder and black eyeliner for a fashionable zombie? 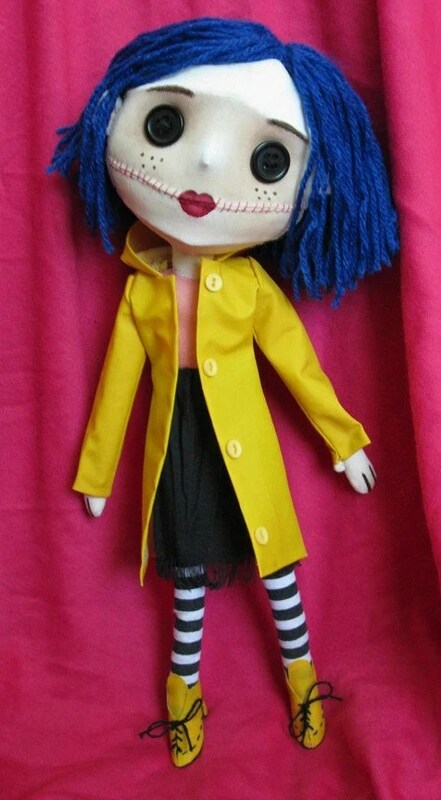 Maybe SewLolita’s Coraline doll (based on Neil Gaiman’s novel by the same name) will serve as inspiration. What other creative things could you do to turn a book character into a Halloween costume? I’ve recently really been into DIY and handmade stuff (I just cut up an old oversized sweatshirt from a school I don’t even go to anymore and am hoping to turn it into a cute fleece sweater with a pig on the front), and so I’ve been on the search for a good blog with ideas and projects for me to try out. District 12 Has Awesome Hairstyles. I watched the Hunger Games! I waited a week after the movie came out to watch it, and then I went and watched it twice. Though a bit too artsy for my liking, it didn’t disappoint. It was nothing like how I felt after Percy Jackson (ugh), and I’m looking forward to Catching Fire. But this isn’t a movie review.